So did you see this guy they call Jetman flying around in formation with real fighter jets the other day? Yeah, his name is Yves Rossy, and he's clearly nuts. He straps a contraption to his back that he calls a wingsuit, and flies around at speeds of up to 180mph. Are you kidding me?! The suit consists of a pair of carbon-fiber wings about eight feet across, and four kerosene-powered jet engines. 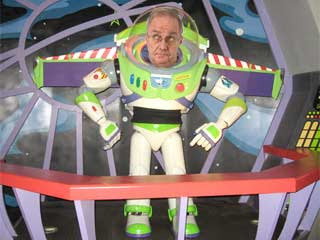 Think Buzz Lightyear from the Toy Story movies. He debuted this thing back in 2006 and became the first, and only, person to achieve sustained flight by affixing a wing and jet engines to his back. And while it is not surprising he's the only person in the world to do this, the fact that he hasn't yet killed himself is. So why does he get a jetpack? I don't remember a time in my life when the prospect of flying around in a jetpack didn't seem to be just around the corner. The idea of the jetpack goes all the way back to the late 1920s - no I wasn't around then - and a fellow named Anthony Rogers. You might know him better by his nickname "Buck". Buck didn't waste time getting from here to there in a car, or running into a phone booth to change into a cape, like some superheroes. No this guy was tricked out in a jetpack way back in 1928. Which is really saying something, since jets had not yet been invented. By the 1960s, jet technology had been around for some time, and there seemed to be serious prospects of human flight on the horizon. At least that's how they made it seem in movies and on TV. Remember James Bond flying around in the 1965 film Thunderball? Well the Bell Rocket Belt, which debuted publicly in 1961, was the inspiration for that scene. It was this device that captured my imagination - along with most people my age - and how I imagined myself moving about the latter half of the 20th century. Yet here I am, still waiting in airport terminal lines with all of the other flightless schmoes. So what's the hold up anyway? Well, it would seem that we humans just aren't all that aerodynamic. More accurately, we are not in the least bit aerodynamic. We belong flying up in the sky as much as a fish belongs behind the wheel of an automobile. But that's never stopped us before, has it? We put a man on the moon for Pete's sake. Seems the biggest problem is that the weight of the apparatus and fuel required to generate enough lift for a human being is not conducive to very long fights. The Bell Rocket Belt's maiden voyage, for example, lasted just 13 seconds - only one second longer than the Wright brothers' first flight way back in 1903. In fact, prior to the Jetman approach, with the addition of wings, the longest sustained flight with a jetpack was just over a minute. Clearly if an easy solution was possible, it would have come along by now. Just imagine how much money people would fork over for their very own jetpack. Glenn Martin, a New Zealand inventor, seems to think it is about $100,000 dollars. He's sticking with the jetpack approach (no wings) and has flown his for almost ten minutes, and reached a height of 5,000 feet. On that last flight he wisely strapped a dummy to it, rather than go that high himself. But rather than the sleek Buck Rogers style, his looks more like you've strapped a pair of trash cans on your back. To this criticism, he told the NY Times "if someone says, 'I'm not going to buy a jetpack until it's the size of my high school backpack and has a turbine engine in it,' that's fine, but they're not going to be flying a jetpack in their lifetime." Sigh. Looks like it's just not in the cards for me. I can cough up $100k for ten minutes in a flying trash can, or spend a few million to end up a smoking hole in the ground with a Jetman-type device. And let's not act all surprised when it happens, you know that's where he's heading with that thing.